a big congratulations to designer bonnee sharp at studio bon on her new website! designed by kate at three square design (who did the first d*s redesign and shop a few years back), bonnee’s new site showcases her incredible interior design projects, textile designs and pillow collection. the best part? you can buy bonnee’s fantastic pillows and fabrics online- no decorator or trade-contact required. fabrics range from around $90-$95 per yard (i’m think i’ll pick up a yard to do several small projects around the house) and pillows are $130-$140 each. click here to check out (and shop) bonnee’s full collection. also, if you missed our sneak peek into bonnee’s seriously incredible house, click here to check it out- it’s a textile-lover’s dream. 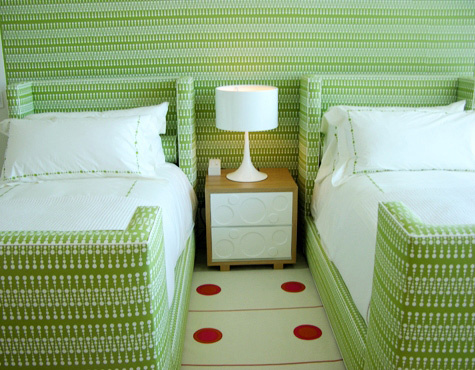 Whoa, I want my furniture to match, but I’m not sure about blending… Love the green pattern, though. 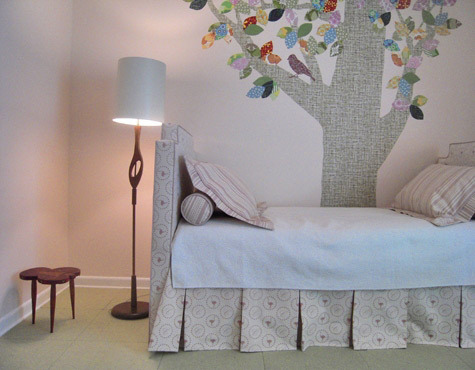 Also LOVE the second, white room with the tree wallpaper and neat furniture! I love that tree on the wall; how crafty! wow…love those rooms!! they did an amazing job. Oooo, the black and white spots!! I would love to know how to make or get the tree and bird images. It looks as if it is all textile on the wall. very pretty and relaxant rooms!! the pillows are amazing! Though what really got my eye at first was the beautiful mural art; it looks like it’s got a texture to it, do you know if it was made out of fabric? Do you happen to know if Studiobon sells it as well? even i want to know how to make that tree on the wall… has it been stuck on with cloth? The tree is actually a design by Dutch Designer Inke Heiland. Her website http://www.inke.nl shows more of her work.